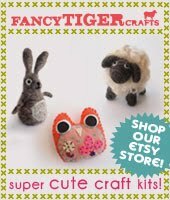 Fancy Tiger Crafts: New Books! There have been a ton of new books released this Spring - here is the lowdown on all the new crafty goodness! 1. Handsewn by Margaret Rowan - This book is a beautiful encyclopedia of techniques for all types of handsewing, including tailoring techniques and embroidery embellishments. 2. We Love to Sew by Annabel Wrigley - This is a fantastic book for aspiring young sewists! The book is filled with fun projects, each with detailed photo tutorials that make the projects easy to follow. 3. The Essential A-Line by Jona Giammalva - a book all about A-lines! This book includes 1 paper pattern with 17 different tutorials based on the pattern including pleats, ruffles, decorative pockets and patchwork! 4. Stylish Dress Book by Yoshiko Tsukiori - We are so glad this book is now in English! This is one of our favorite Japanese sewing books featuring simple and, yes, stylish dresses and tunics. 5. 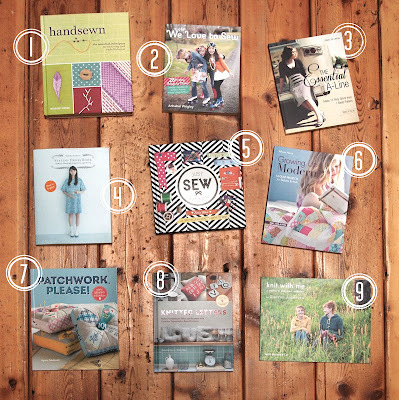 Just Sew Stories by Katie Allen - This book contains awesome projects for gifts! Everyone in your life is covered--with awesome projects like a "Totes" tote, Frida Kalho throw pillow, a hipster doll or a life-sized realistic and personalized cat pillow! 7. Patchwork Please! by Ayumi Takahashi - This book is amazing--I if I can find the time to make all the projects in this book, my house will be the craftiest and cutest place ever! 8. Knitted Letters by Catherine Hirst and Erssie Major - This book is filled with witty and charming projects that involve letters or type. 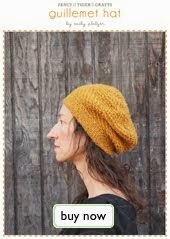 There are charted knitting patterns for tons of awesome fonts as well as my favorite project - 3D knit, stuffed letters! 9. 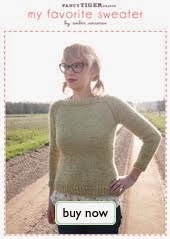 Knit With Me by Gudrun Johnston - This mother/daughter collection has been highly anticipated by us Fancy Tigers as we are huge Gudrun fans. She did not disappoint! Knit With Me includes 12 sweaters and knit accessories in Gudrun's beautiful and sophisticated designs, sized for adults and kids. Latifah Saafir, we ♥ you! Laurelhurst Sock Knit Along was Socktastic! 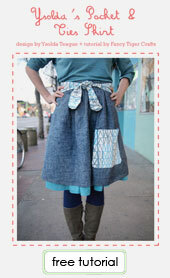 New Shibui Linen is here!